The opportunity for music study is one of the most valuable gifts we can give our child. In our world of fast food, instant gratification and almost constant connectivity to technology, the focus and discipline developed by study of a musical instrument creates valuable emotional and cognitive pathways in the brain. Research continually supports this fact and many parents desire music study for their children for this very reason. It takes tenacity and vision to successfully see your children through their music study. Everything in our lives and culture seems to push back against the ability to gain this lifetime skill. 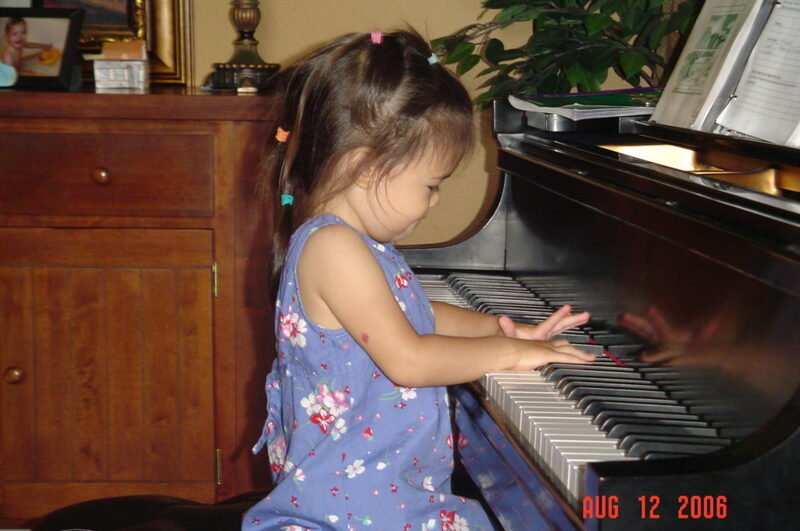 In the thirty-nine years I have taught piano, it is only in the past eighteen years, when I became a music parent, that I have truly understood and appreciated the herculean effort that goes behind a child learning to play an instrument successfully. To all my fellow music parents out there – you deserve a lifetime award for one of the most challenging feats ever! Expose them to live concerts of beautiful music. Find them the right fit of instrument. Find them the right fit of teacher or program of instruction. Delight in their music making – always. Encourage every opportunity to share their music. Tune in with what goes on in the lesson and their progress. Stay in touch with the teacher and your child’s needs. Do not fear a teacher transition if needed. The ingredients above are listed in the order of what I consider to be of the greatest priority. Why did I not list finding a teacher first? In my own experience, long before my children started any formal instruction, we made an intentional commitment to utilize every possible opportunity for exposure to live music, in a child friendly setting. I feel that this strategy really impacted the mindset with which my children viewed music study. Listening and watching music being performed was a fun activity and part of the tapestry of our lives. Music study was the natural next step. So, what does this look like if you have a baby, or, a one to three year old child? We were fortunate enough to be living in Cleveland, Ohio, when Anna and Elise, my first two children were born. Chris and I packed up our little Mazda 323 hatchback with six month Anna, a picnic basket, blanket, a stroller and other (silent!) toys to drive the 45 minutes to the Blossom Music Festival concerts in Cuyahoga Falls, summer home of the Cleveland Orchestra. The secret was getting the “lawn tickets” – the least expensive tickets of all. We strategically chose the far edges of the picnic area in case of an emergency exit. We sprawled out on our blanket without the pressure of decorum, had fun rolling the inflatable ball back and forth and eventually put the baby in the stroller with her blanket and toys. Our goal was for live performances to be as second nature for our children as listening to recorded music at home. Our only mistake was not realizing the impact of fireworks on a sleeping baby at the end of the concert … that emergency exit plan was put to use as we hurried out with a screaming baby in the midst of glorious fireworks! Circumstances do not have to be perfect to have fun at a concert. One summer, we attended a free Philharmonic concert on the lawn. Unfortunately, we had forgotten to check the weather report. Six of us huddled under two broken umbrellas and an old picnic blanket, laughing and shivering, as we listened to the music of Broadway and John Williams at dusk. An elderly couple got up and started waltzing in the drizzle. Sheer magic – a family memory made together. In my next blog, I will explore the topic of ensuring the right fit of instrument and teacher for your child. Until then, I am going to make the most of each remaining day of summer – wishing the same for you too! Being a Music Parent: Tales from the Battle Front (Intro). Love the picture! can’t wait for the next installment!